With a love of education and fond memories of his own schooling, it's no wonder CSU alum Duncan Kendall left a career in banking to become a teacher. 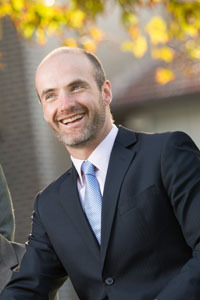 Now Assistant Head of The Scots College Preparatory College in Sydney, Duncan first completed his Bachelor of Education Primary with CSU before returning for his Master of Education (Leadership). It meant a lot to Duncan's family that he should make the move into education, as his aunty in England was also a teacher. Today the pair swap notes and share classroom experiences whenever they can. Here Duncan gives an insight into why he loves his profession. My childhood...was full of love and encouragement, however I had to work for every achievement, which I feel has set a good foundation later in life. I chose CSU...because of its reputation in Education and the diversity of its students. My best experience at CSU...was the variety on offer -residential college life, peer tutoring programs, dorm games, pub runs, boxing in Uni fight nights and more importantly the friendships. My worst experience at CSU...was resubmitting my first essay that had a distinction on it which was crossed out due to incorrect referencing. At university I...was inspired to love my profession of teaching and see it as an art. Today I'm...motivated by the hope and excitement on my students' faces. In my profession...it is important to keep a healthy balance of work and family. You could work for three days and never complete your to-do list. The biggest influence in my life...is my family and those who have taken the time to teach me to be a better and more empathetic person - personally and professionally. I'm most proud...of being a father. That is the greatest privilege and honour, but also a responsibility. My greatest achievement...is to follow my passion and not care about what others may think. When you are a teacher you can have considerable impact on someone's life, in either a positive or negative way, so I am passionate about being the best I can be, no matter how tired or challenged I may feel. The best piece of advice I ever received...was if you could put your head on the pillow at night and be at peace with yourself and your actions, you are a true man. If I could do it all again...I would worry less about what I can't control and drink better quality wine in my twenties. One last thing...what lies behind you, and what lies ahead of you, is nothing compared to what lies within you.